Anglicans Online | Why a gryphon? The gryphon (or griffin) myth originates somewhere in the Near or Middle East. The mythical beast is found depicted in ancient Babylonian, Assyrian, and Persian paintings and sculptures, having the head and wings of an eagle and the lower body of a lion. Griffins were supposedly guardians of the gold mines of ancient Scythia, and this story was often conflated with their having nests of gold and laying eggs of agate, which they guarded fiercely. Their eyesight, owing to their aquiline heritage, was clear and sharp and they became known as well for their swiftness. The quality of intense vigilance along with their fantastic appearance made gryphons a favourite in heraldic art. Its dual nature made it a symbol for the union of God and man in Christ and it's commonly found in mediaeval bestiaries. The combination of speed and vigilance seemed appropriate for what we do here at Anglicans Online. We see ourselves as watching out for all things related to the Anglican Communion and bringing what we find to these pages as quickly as possible. 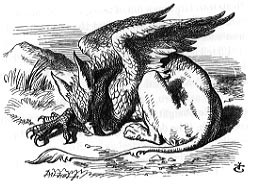 Although gryphons are usually rather stern and forbidding creatures, the sleeping gryphon in Lewis Carroll's Alice in Wonderland is quite charming (and amiable as well), to wit: 'The Gryphon sat up and rubbed its eyes: then it watched the Queen till she was out of sight: then it chuckled. "What fun!" said the Gryphon, half to itself, and half to Alice'. 'In the Purgatorio, Canto 29, of Dante's Divine Comedy, the chariot of the Church is pulled by a gryphon', we read in a note in The Annotated Alice (Martin Gardner, new edition 2000.) Although we had quite forgotten Dante's image when we chose the gryphon, we do rather like this symbolism. The actual Anglicans Online gryphon is taken from the 'Initials and ornaments' portion of the type fount Golden Cockerel, designed by Eric Gill in 1929. The type was digitised in the 1990s by the International Typeface Corporation and 'ornaments were created to reflect the nature of Gills interpretive style of typographic design. ... The ornaments, which interpret and celebrate Gills skills as an illustrator, are taken from a rich vein of material: the Four Gospels, a leaf pattern designed by Will Carter, collections found at the The British and The Victoria and Albert Museums, and published references that include borders, tailpieces and typographic devices'. Our gryphon is an ornament in the ITC Golden Cockerel family. An Internet search for gryphon or griffin will produce a vast number of pages if you'd like to read more about these intriguing mythical animals.